A powerful earthquake in Taiwan felled a 16-storey apartment complex full of families who had gathered for Lunar New Year celebrations Saturday, with at least twelve dead and more than 20 feared trapped. The death toll is rising in the historic city of Tainan, which bears the brunt of the 6.4-magnitude quake, as rescuers scour rubble for survivors. An entire residential complex of four buildings containing almost 100 homes toppled, left on its side with twisted metal girders exposed and clouds of dust rising from the jumbled concrete. Officials said there were 256 people registered as living in the complex, which contained 96 apartments. More than 250 have been rescued so far, with more than 40 hospitalised. Around 800 troops are mobilized to help the rescue effort, with sniffer dogs also searching through the rubble. 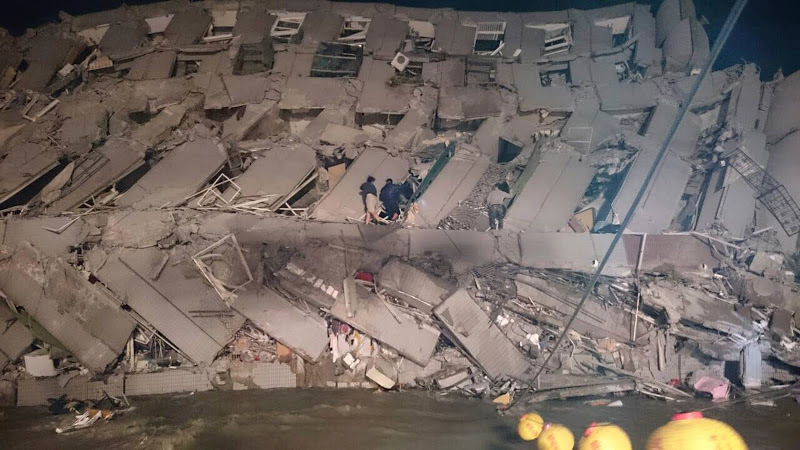 Across Tainan and surrounding counties, more than 400 people were injured, with 100 still in hospital. Eight shelters have been set up around the city, with over 100 people taking refuge there.